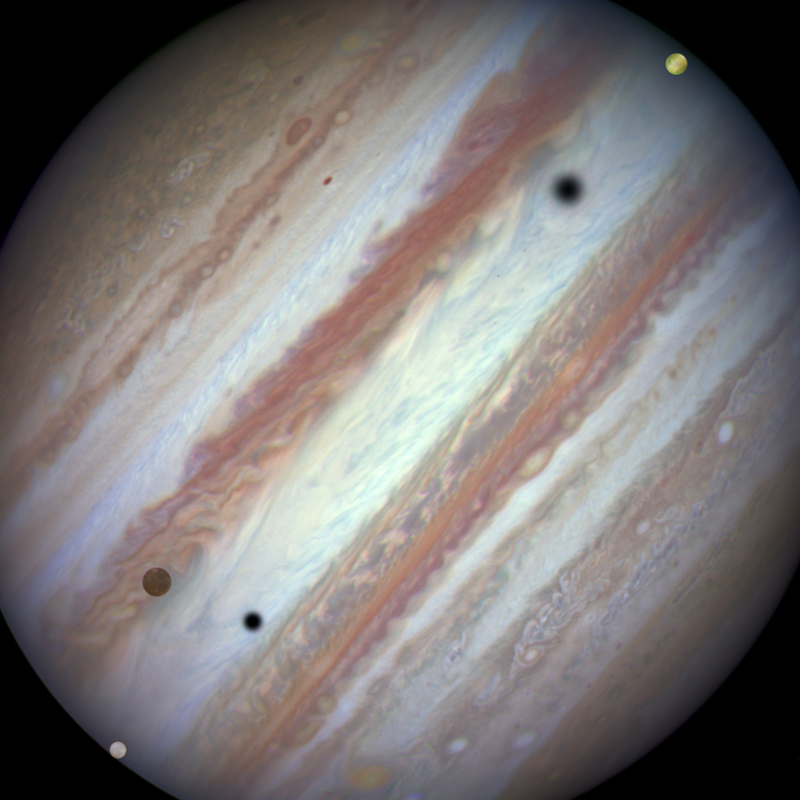 Explanation: Our solar system's ruling giant planet Jupiter and 3 of its 4 large Galilean moons are captured in this single Hubble snapshot from January 24. Crossing in front of Jupiter's banded cloud tops Europa, Callisto, and Io are framed from lower left to upper right in a rare triple-moon conjunction. Distinguishable by colours alone icy Europa is almost white, Callisto's ancient cratered surface looks dark brown, and volcanic Io appears yellowish. The transiting moons and moon shadows can be identified by sliding your cursor over the image, or following this link. Remarkably, two small, inner Jovian moons, Amalthea and Thebe, along with their shadows, can also be found in the sharp Hubble view. The Galilean moons have diameters of 3,000 to 5,000 kilometres or so, comparable in size to Earth's moon. But odd-shaped Amalthea and Thebe are only about 260 and 100 kilometres across respectively.